Keith Dowman is a well-known translator of Tibetan texts, and writer on Buddhist lore. Kevin Bubriski is an award-winning photographer, also well-known, for his stark, black and white portrayals of the nitty-gritty face of Nepali dukha. After penning his pioneering guidebook, Power Places of Central Tibet, Keith has been focusing his research on the "power places" of Kathmandu Valley. In the meantime Kevin, has been turned on to the magic of color transparency, and taken a new look through the lens at his old home town. The result of Kevin's conversion to less harsh realities, and Keith's continuing research into the less obvious ones, is a handsome over-sized volume, Power Places of Kathmandu; Hindu and Buddhist Holy Sites in the Sacred Valley of Nepal [Inner Traditions International, Rochester, Vermont, $39.95 cloth], containing 108 color photos by Bubriski with a solid text by Dowman. The text consists of an Introduction, and of nineteen entries detailing a selection of temples, shrines and stupas in Kathmandu, Patan, Bhaktapur, and their environs. There is also a glossary of Sanskrit and Newari terms, and a map of the Valley with insets showing the location of each site. 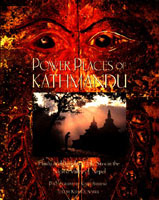 The Introduction is an immensely readable chapter, sparkled with felicitous phrases showing Keith Dowman's love of the special ambiance of Kathmandu Valley - blessed by gods and buddhas - and his appreciation of the unique culture of the Valley along with the genius of its people. He defines a power place as "a focal point of divine energy, where humans can make contact with the realm of the gods." Sites where "geomantic forces, divine myths, and human history and legend combine to make these locations sources of spiritual revitalization and psychic renewal." Dowman then goes on to introduce the reader to the culture and history of Kathmandu Valley, i.e. Nepal Mandala, Playground of the Gods. He is particularly good at describing the religious tapestry of myth and custom, woven by various ethnic and religious groups, which covers the Valley and its power places. Each power place in the book is then described on several levels in detail. First come the myths and legends associated with the place. After that is given a history of the particular site, and finally a detailed description of it, explaining its various features and constructions, and highlighting the artwork in and around the shrine. All in all, this is a text which should charm and enlighten the layman, while it stimulates the serious scholar. Kevin Bubriski's offering in this exciting collaboration is a portfolio of beautiful photos, some of them quite memorable, taken mostly at the power places described in the book. These images are the offspring of a triple love - Kevin's love of Nepal and its people, of photography, and his newfound love of the color process. The result, is, of course, lovely and lovable. The close-up faces of the gods, the details of temples and stupas, lovingly brought out from the mists of time, and fixed, at least for a moment, against the accelerated blur of modern vision, are welcome sights to rest one's eyes on and contemplate. Kevin is particularly inspired when he photographs the divine elation of street festivals, and the serene acts of human devotion. Here is a photo album which will add significance while adorning any book lover's cocktail table. Beware, armchair travelers, you may find yourselves traveling into another realm of consciousness, as you leaf through the pages of this book.